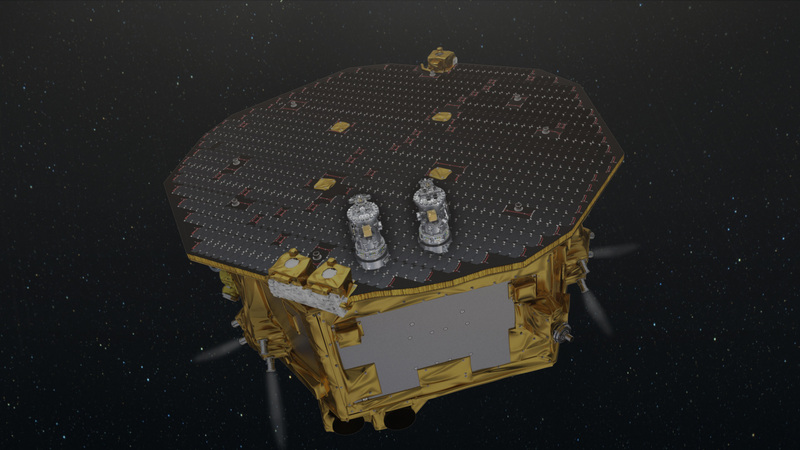 The LISA Pathfinder has begun its second mission phase in its quest to validate the technologies needed for a full-scale mission dedicated to the measurement of gravitational waves. Predicted by Albert Einstein’s Theory of General Relativity, gravitational waves, arising from the interaction of massive celestial objects, represent small ripples in spacetime that travel vast distances through the universe. 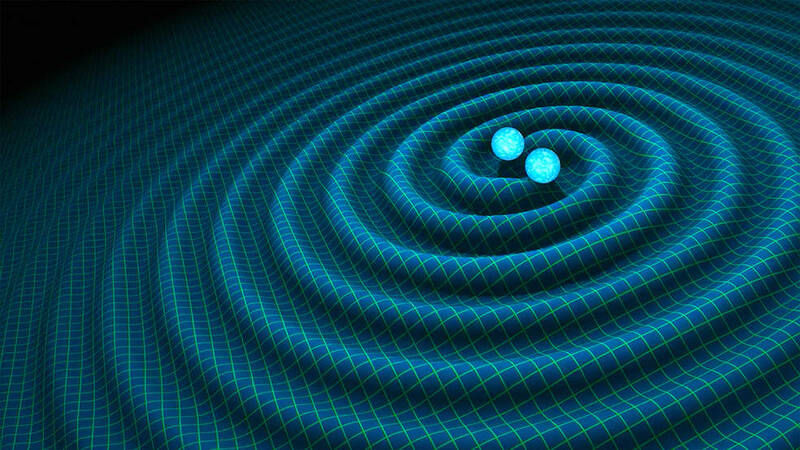 The measurement of gravitational waves requires great precision due to the minute energy of the waves when reaching Earth, and a large distance between measurement stations given the waves propagate at the speed of light. 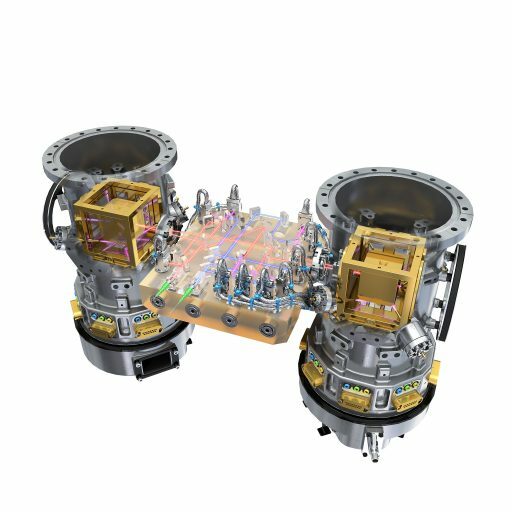 LISA Pathfinder features a pair of gold-platinum test masses that are placed in a perfect gravity-driven free fall environment. 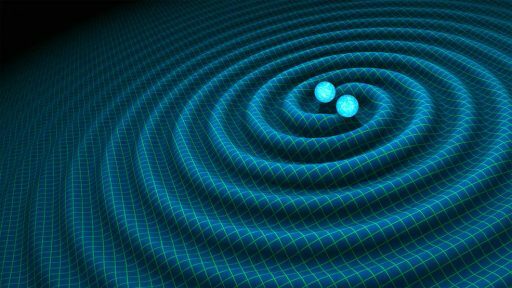 With only 38 centimeters between the masses, they can not detect passing gravitational waves, but they permit the demonstration of the measurement principle with an accuracy of just a few picometers. Launched by a Vega rocket on December 3, 2015, the spacecraft used its own Propulsion Module to lift itself into progressively higher orbits before departing Earth for its worksite, the Sun-Earth Lagrange Point 1 located 1.5 million Kilometers from Earth. Separation of the propulsion module paved the way for the start of the mission’s experiment program broken down into segments, the first three months using the LISA Technology Package and the second half of the mission testing the Disturbance Reduction System with a planned extended mission again exercising the LTP and Cold Gas Microthruster system. Launch locks and a positioning mechanism holding the cubes secure for launch and the transfer to L1 were released in February and science operations began in March. The principle of the LISA Pathfinder mission calls for the two masses to be in perfect free fall in all translational degrees of freedom, no force is purposely applied to the masses and their position is accurately measured. The spacecraft follows the first test mass by using microthruster system that enables it to ‘free fall’ along with the mass, correcting for external influences such as solar pressure to never come into contact with the mass itself. The second mass is free along the y and z axes and the spacecraft can follow this by using rotation around these two axes. 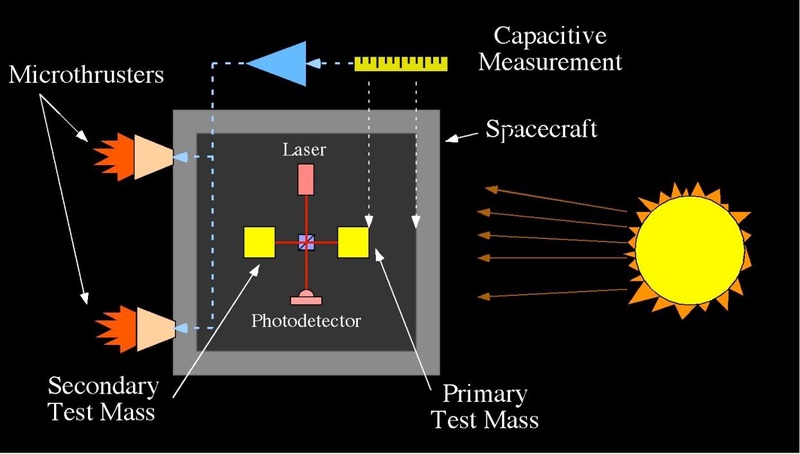 The high-precision laser interferometry measurement system will track the motion of the test masses relative to the spacecraft to allow for test-mass to test-mass tracking for gravitational motion with an accuracy of a few picometers. 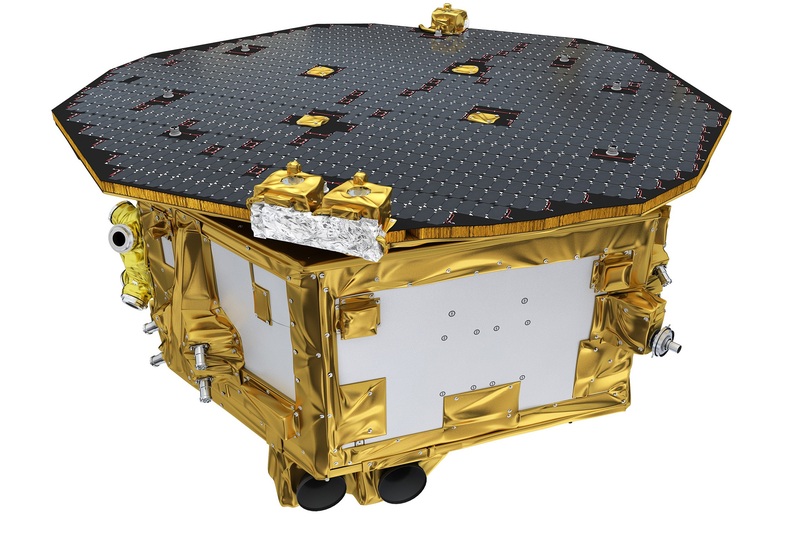 To verify how still the two masses were in different conditions, LISA Pathfinder heated the experiment chambers and applied increasingly stronger magnetic and electric forces to the masses to assess what amount of force is needed to divert them from their perfect free fall conditions. 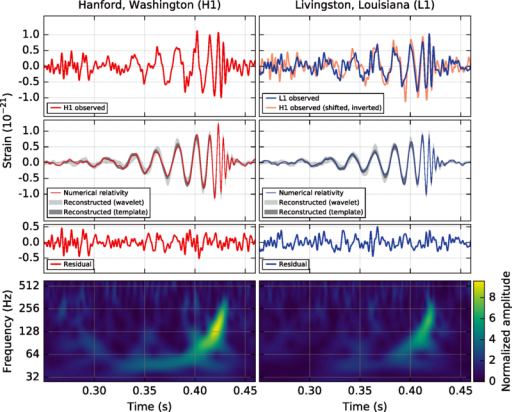 The overall aim of the study is to reduce noise for the actual measurement mission to be able to unambiguously separate a passing gravitational wave from background noise. 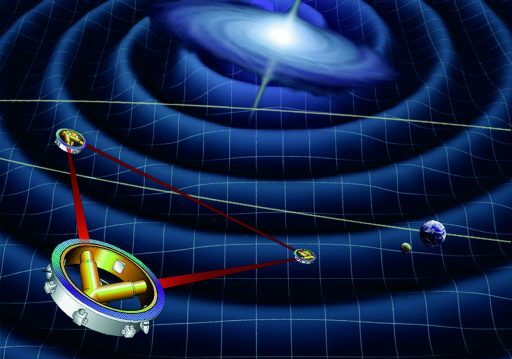 Just when the LISA Pathfinder had entered commissioning, the first direct measurement of gravitational waves was announced by the Laser Interferometer Gravitational-Wave Observatory (LIGO) that uses a pair of ground-based measurement stations 3,000 Kilometers apart. The detection was traced to the collision of two black holes 1.3 billion light years away, marking a milestone in high-energy physics and validating Einstein’s 100-year old theory. 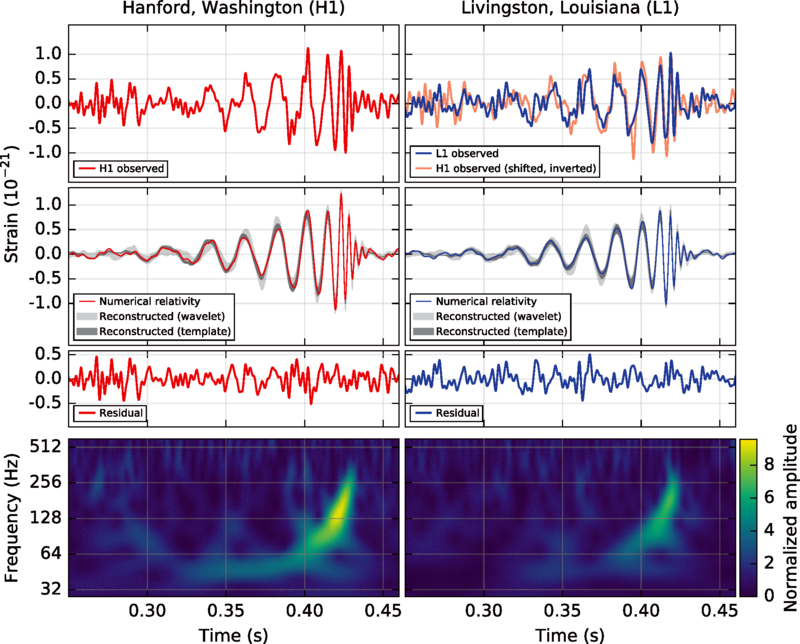 While a measurement of gravitational waves around the 100Hz frequency is possible on Earth, only sensors deployed to space and stationed at great distance from one another can reveal low-frequency gravitational waves less than 1Hz to widen the window on the high-energy cosmos opened by the LIGO observation. Such measurements would permit an in-detail study of galaxy mergers, neutron star binaries and black hole interactions. 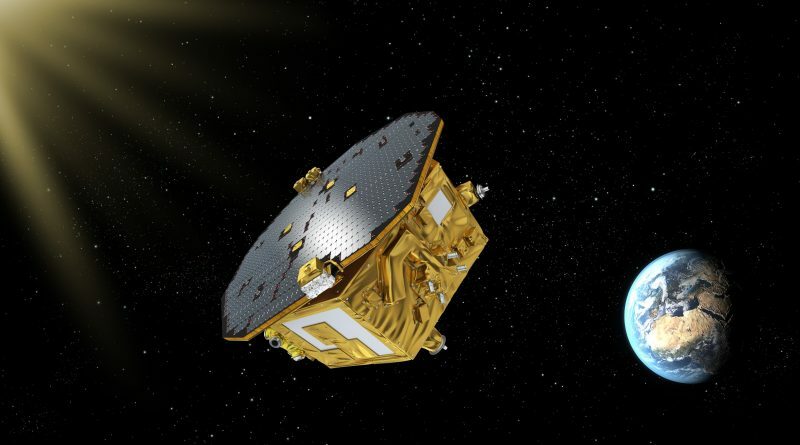 In June, the LISA Pathfinder mission team shared the initial results of the test – reporting the free-fall environment of the two test masses was better than originally required with the two masses almost motionless with respect to each other and only experiencing a relative acceleration of ten millionths of a billionth of Earth gravity – around 10,000 times better than any previous drag-free mission. 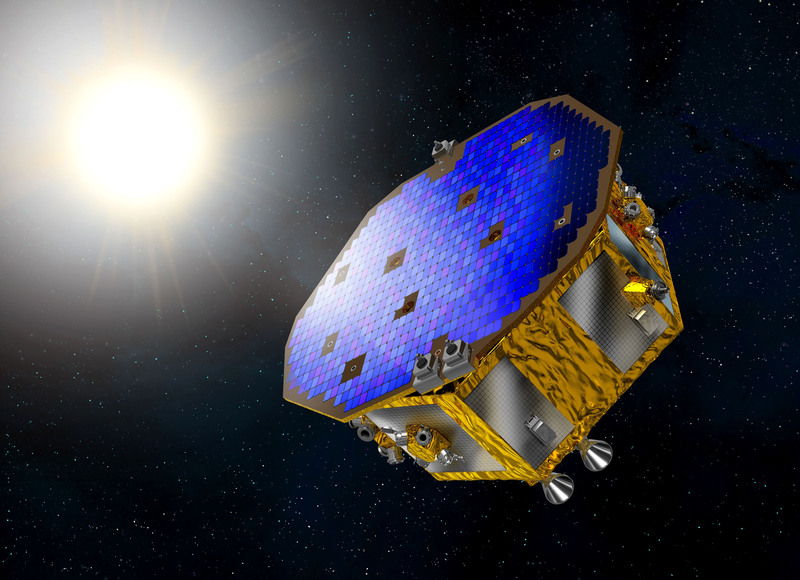 The detection by LIGO and the positive results of the LISA Pathfinder mission promptly lifted support for a full-scale LISA mission as ESA’s next large-class mission. 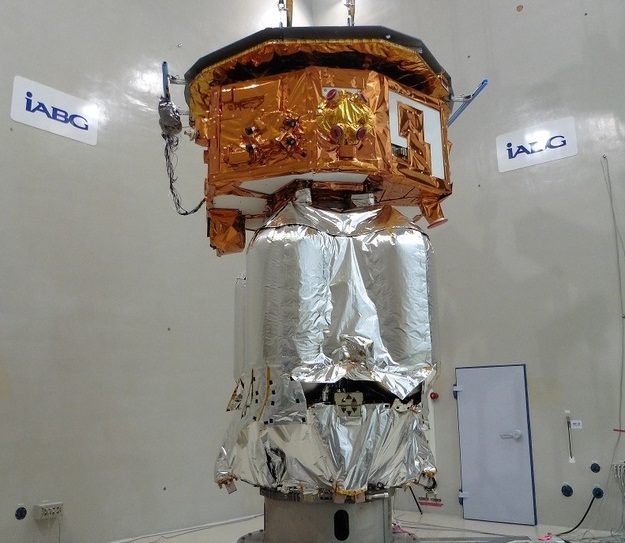 However, for a full-blown LISA mission, at least three more years of technology readiness level assessments are needed before a ten-year development effort would begin, placing launch in 2029 at the earliest with 2034 being a realistic goal ESA will be working toward. On June 25, the LISA Technology Package completed its demonstration mission, handing over to the Disturbance Reduction System (DRS) provided by NASA. DRS will employ the LISA Technology Package as its inertial sensor to create a drag-free environment by using Colloid Micro-Newton Thruster Assemblies that can deliver extremely small thrust at great resolution to keep the test masses to within 10 nanometers over an operational frequency range of 1 to 30 milli-Hertz. DRS will be in action for three months, exercising the Electrostatic Ion Propulsion technology in an operational environment, using high voltages to generate electrostatic fields in which ions are separated from a colloidal fluid and accelerated to large exhaust velocities, thus supplying a controllable thrust and impulse bit. DRS is currently in the midst of a two-week commissioning operation ahead of an operations phase to last through October. After the DRS demonstration, LISA Pathfinder will enter a recently approved seven-month mission extension, again switching back to the LISA Technology Package and its Cold Gas Microthrusters to continue refining the control of the spacecraft around the test masses to fine-tune the sensitivity for the critical sub-Hz frequency range. 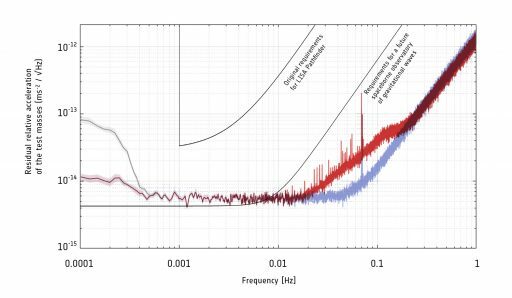 At present, the limiting factor for frequencies smaller than 1mHz is a centrifugal force created by the orbital geometry of the mission and the effect of noise from the Star Trackers used to orient the spacecraft to point to the sun. Data processing on the ground can account for some of the noise and the full-blown LISA mission will use a different orbital design to mitigate centrifugal force. In the range of 1 to 60mHz, control over the test masses is limited by interactions with residual gas molecules present in the vacuum chamber. Although the chambers were vented once in space, there is still some outgassing causing gas molecules to collide with the masses. In the extended mission, this effect is expected to grow progressively smaller. At higher frequencies up to 1Hz, the instrument’s precision is limited by the performance of the laser interferometer and electrostatic monitor tracking the precise position of the test masses. A prominent spike right around the 70mHz frequency is still under investigation and will likely find an intrinsic cause aboard the spacecraft. Another effect visible in the curve is a bump between 0.02 and 0.2Hz caused by a misalignment in the test masses in the y and z axes, perpendicular to the laser interferometer – a contribution that can be subtracted in data processing. Having surpassed its original requirements by orders of magnitude, the precision reached by the LISA Pathfinder approached that required from the full LISA mission, providing confidence that the future gravitational-wave observatory will be successful in widening the current understanding of the high-energy universe by providing observations of interactions between supermassive objects at distances of billions of light years. 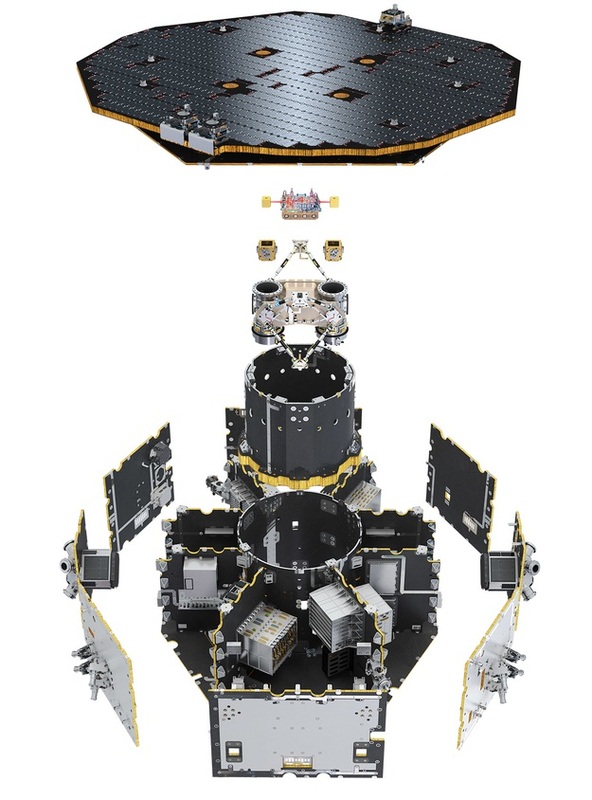 The LISA/eLISA mission concept calls for three spacecraft flying in a an independent orbit around the sun and maintaining a triangular formation. Each spacecraft will keep a test mass in a perfect free fall and the distance between the masses will be measured by a laser interferometer over a separation of five million Kilometers.